Extension Table Dimensions - 38-1/8" x 17-1/2"
Total Load Capacity - 220 lbs. Drawer Load Capacity - 44 lbs. Dimensions (L x W x H) - 25-1/4" x 23-5/8" x 46-5/8"
Cart Table Dimensions - 17-1/2" x 14-1/4"
Extension Table Length - 41-1/8"
Extension Table Width - 19-5/8"
Extension Table Height (Extended) - 35-1/2"
Extension Table Height (Collapsed) - 3"
The new Festool MW 1000 let's you take your workshop to the jobsite. The mobile workshop excels with its ease of use for transportation, assembly and disassembly that increase your productivity and efficiency. In just a few steps, the sophisticated and compact unit becomes a stable workplace with direct access to all of your tools wherever you are. Just like in your own workshop. 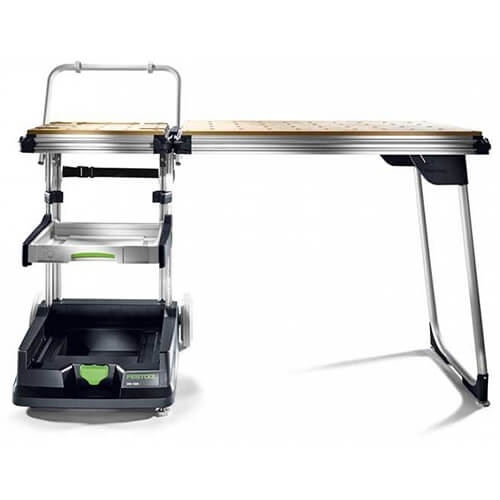 The extension table is compatible with the Festool MFT/3 and CMS to expand the work surface for those tools, as well. The MW 1000 let's you transport your tool Systainers, CT SYS dust extractor or other Systainer to and from the jobsite with ease. The compact design easily fits through doorways, can traverse stairs and has large rubberized wheels. The MW 1000 comes with one drawer that can be adjusted to any height and additional drawers can be added (203456). A leveling foot allows you to stabilize the MW 1000 on uneven surfaces. The mobile workshop shares the same height as the Festool MFT/3 and CMS. It uses the same hole grid as the MFT/3 for clamping and dogs, sold separately.